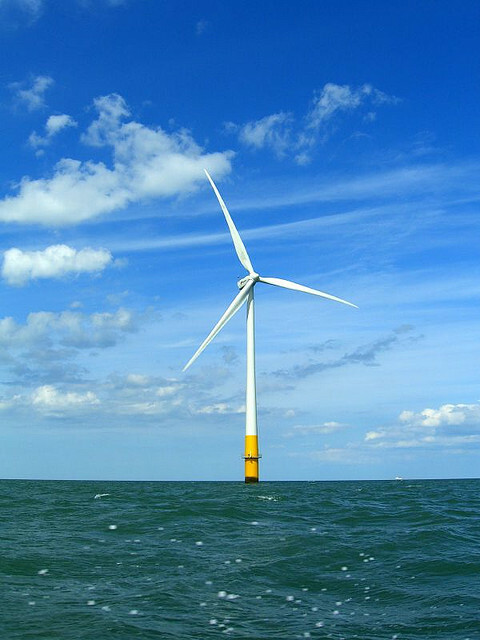 The creation of offshore wind energy involves installing turbines which are able to harness the power of coastal and offshore winds to create electricity. These offshore wind turbines look very similar to the onshore wind turbines and work in the same way. The difference is that unlike the onshore models, the bottom of the offshore turbines are meant to float or be mounted to the ocean floor. What are wind turbines like? Wind turbines follow one of two forms: turbines with a horizontal-axis or turbines with a vertical-axis. However, the majority of large-scale turbines being installed today are of the horizontal axis variety. This type of wind turbine typically has two or three blades that face into the wind and spin as the wind moves through them, similar to a pinwheel. The rotation of the blades creates an electric current which powers a generator. This generator sends power down the main shaft of the turbine to transmission lines. These transmission lines are then ran across the seafloor to an onshore power station where it can be distributed. The large, utility-scale turbines that are used today in wind farms or connected to the grid typically are very large machines with blades that range from 88-128 m. These can generate anywhere from 2.1-7.5 MW each. However, there are older turbines, around the 500 kW scale, that are still active. Small turbines, those around 100 kW or less, can be used in conjunction with other sources by businesses, homes, or on off-the-grid sites. A good example to look at in North Carolina for this would be Jennette’s Pier, Jockey’s Ridge State Park, or the Outer Banks Brewing Station. These sites all have small turbines which are used to cover part of their electricity costs. Based on the need for renewable energy, the large turbines will be the most effective at supplying energy and are the most likely candidates for creating offshore wind farms. Even though offshore wind is a large resource that has not been utilized by the U.S. thus far (although there are some plans underway for offshore wind farms, like Cape Wind), it has been a huge resource in Europe and the U.K. for years. However, the U.S. does have plans to begin installing wind turbines with the hopes of providing 20% of their electricity generation from wind by 2030 (Kaldellis and Zafirakis, 1898).